Cold Fusion - Excess Heat From Novel Chemical Reaction? Cold Fusion has been beset by problems since Martin Fleischmann and Stanley Pons made their announcement of excess heat production in an electrochemical cell back in 1989. While many researchers have found excess heat production in variations of the experiment, and some have found indications of nuclear processes, no one has come up with a perfectly repeatable, commercially viable way of using Cold Fusion for the production of energy. Cold Fusion Reactor by JL Naudin based on the work of Japanese researchers Tadahiko MIZUNO and Tadayoshi OHMORI. This era of uncertainty may be coming to an end with the work of chemistry professor Fu Liu, of the Environmental Management College of China in Qinhuangdao, whose recent article in Infinite Energy magazine (Issue 68, 2006, pg 34 - 37) proposes a solution to the riddle. The article, titled Excess Energy from Chemical Reactions of Water (H2O and/or D2O) makes a point that electrolysis of water in the presence of certain catalysts will produce a combustible substance showing organic properties (named CSSOP) which will either burn like a hydrocarbon or produce heat by "wet oxydation", depending on its concentration. Thus a mechanism for the excess heat production in Cold Fusion experiments has been proposed that is within the laws of thermodynamics and chemistry. Below is a summary with extensive quotes from the paper of Fu Liu, as published in Infinite Energy. A combustible substance has been obtained from chemical reactions of water (H2O and/or D2O) using methods of electrolysis and catalysis. Experimental results indicate that the combustible substance was generated through transferring electrons from water and it has shown dual properties - those of inorganic water and of organic compounds. The oxidation, including combustion and wet oxidation, of this combustible substance will release a large amount of heat energy, opening prospects for use in clean energy production. Electrolysis of light water with iron (anode) and nickel (cathode) was performed using two methods: alternating current with high voltage up to 220 V and high current density up to 20 A/cm2 (electrode) lasting for around one minute; direct current using low voltage of 12 V and low current density of several mA/cm2 maintained for a couple of days. The high voltage ac electrolysis excites the medium, while the treatment with low voltage dc catalyses changes in the water's chemistry. Liu points to the importance of selecting proper catalysts and promoting the formation of active sites for water conversion. (1) Analysis of elemental composition shows carbon, hydrogen and oxygen in the electrolyte. (2) CSSOP is combustible. It can be fired into combustion at higher concentrations, while at low concentrations it will provide heat by liquid phase oxydation. The calorific value of CSSOP is similar to hydrocarbons and alcohols respectively. (3) CSSOP is composed of two kinds of products - one of them are hydrocarbons like liquid fossil fuels, the other are oxygenated compounds similar to alcohols which are regarded as transition products. (4) Density of CSSOP is less than water, in the range of 0.80-1.00g/cm3 for the hydrocarbon type and 0.75-0.80g/cm3 for oxygenated type. (5) Electrical resistance of CSSOP varies greatly from very large as in insulators to very small as in a superconductor. (6) CSSOP continues burning when diluted with ordinary water. (7) Infrared spectra indicate high adsorption peaks of methyl and methylene. (8) CSSOP is stable and can be stored for a long time. (10) The process of CSSOP formation is accompanied by no or very little reaction heat. (11) No oxygen or hydrogen gases are involved in the reaction. The chemical composition, molecular structure, and physicochemical properties of the electrolyte vary with electrolytic conditions, catalysts and reaction time. Water in the electrolyte is continuously converted to CSSOP until the water is completely (100%) converted. The theoretical basis of CSSOP formation is the isoelectronic principle which says that as long as two molecules have the same total number of atoms and electrons (or valence electrons) they will have the same electronic configuration and bonding scheme, resulting in their having similar properties. In this way, CSSOP and hydrocarbons have similar properties because they are isoelectronic species. H2O and D2O are isoelectronic species, so they may be used with similar results. CSSOP is an organic compound originated through a a novel kind of chemical reaction from inorganic water. Cold Fusion experiments generally involve aqueous solutions and catalysts and some of them have generated more heat than can be explained by conventional chemical theories. According to Fu Liu, catalysts necessary for the formation of CSSOP may have entered experiments as contaminants or impurities in the electrolytic system, which would explain the lack of reproducibility that continues to bug most Cold Fusion experiments. Liquid phase oxidation or catalytic wet oxidation of the CSSOP produced in these experiments will release a large amount of reaction heat. Indeed that is what has been found in many of the experiments. 1) In the process of CSSOP formation, the basic materials used are water and oxygen and the methods adopted are electrolysis and catalysis - very similar to what happens in most cold fusion laboratories. However chemical additives used in most experiments of cold fusion do not have the necessary properties for the formation of CSSOP, and those that do are added into the reaction system as impurities. Cold fusion experiments are aimed at hydrogen physics, not at the chemistry of water. 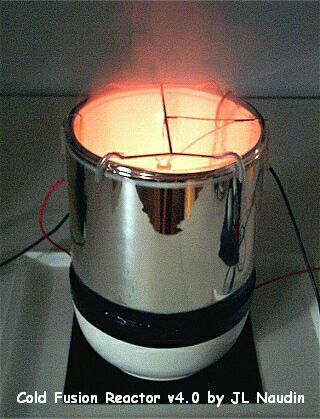 Thus it is hard to achieve reproducibility of excess heat output in those experiments. 2) The "heat after death" phenomenon can be explained by a delayed wet oxidation of CSSOP, a combustion that can continue even after the formation reaction has already stopped. 3) Positive feedback as encountered in some experiments can be explained. Increased temperature of the system increases the reaction rate, including the rate of formation and oxidation of the CSSOP. 4) H2O and D2O have similar chemical properties, which explains why light water and heavy water may get similar results in excess heat production, but only if the chemical nature of the reaction is considered. 5) Higher excess heat is found in experiments involving electrolysis of water, consistent with conditions necessary for the formation of CSSOP. 6) Carbon has been found in surprising amounts on the cathode surface of some experiments. Decomposition or carbonation of CSSOP would be a possible mechanism for the formation of such deposits. 7) Hydrocarbon oil has been found in cold fusion cells, causing an incident of explosion. That oil could be formed by CSSOP containing deuterium. 8) Widely differing results of cold fusion experiments, some generating excess heat but no nuclear products, some generating nuclear products but no excess heat, and some resulting in both nuclear products and excess heat would indicate that two separate kinds of reactions might be at work here that have nothing in common. 9) Catalytic effects play a large role in cold fusion and hydrino processes, confirming the relevance of these findings. 10) A chemical source for excess heat - the oxidation of CSSOP produced from electrolysis and catalysis of water has been found. When optimized, such excess heat production can reach far beyond that observed in cold fusion and hydrino experiments. Excess heat is mainly generated from the formation and oxidation of CSSOP as a result of the chimical reactions of water (H2O and D2O) and oxygen. Without water and oxygen (or air) there will be little or no excess heat production. In order to examine and verify the existence of CSSOP, the chemical composition, molecular structure and physicochemical properties of the electrolyte in experiments should be examined. A combustible substance can be generated from water and oxygen by electrolysis in the presence of proper catalysts. The substance shows organic structure and properties and can be used as a clean source of energy. Previous cold fusion experiments give credence to this discovery. While many problems remain to be solved, there are bright prospects for what Fu Liu calls organic water or oxygen fuel to enable unlimited clean energy production. The full paper, including references, can be found in Infinite Energy, Issue 68, 2006, pages 34 to 37, and a pdf version is available here. What do YOU, personally, think? It sounds like a real breakthrough to me, but I don't feel competent to evaluate it. Let me ask a question that will help me evaluate YOUR view: Do you plan to buy Pd? From what I gather, this new explanation of a possible mechanism for the excess heat generated in Cold Fusion experiments does not depend on PD, but is a result of the electrolysis process itself, which brings about changes in water. My view on this is sympathetic, although confirmatory research is needed, as Fu Liu himself says. I have heard of similar transformation of water to a burnable fuel in my researches of early efforts to develop new energy. Schauberger, apparently had a similar result subjecting water to a continuous, long term vortex-type motion. He obtained, what was at the time described as a substance similar to a hydrocarbon. I believe that there are things in chemistry we don't yet understand, and we should very well look. As for personal involvement, I am not an experimenter. I can only report on what I find others are doing. The only comment I have about the process is that there is evidence of "heat after death" that CANNOT be explained by chemical reactions. The excess heat after the removal of the electrolytic input energy has, in numerous cases, exceeded the energy release of the most highly exothermic reactions known by an order of magnitude. Maybe some excess heat measurements in "heat after death" mode can be explained, but not all! I posted your comment at the end of the article in the comments section. It seems that Fu Liu is talking about a so-far-unknown chemical reaction that actually turns water into a hydrocarbon, thus providing it with "energy to spend" that might be sufficient to explain heat after death in some of the cells. He doesn't say that there may not be also nuclear reactions involved, but he does propose that there is a chemical reaction that is novel. I remember the story very well about Martin Fleischman and Stanley Pons. They were big in the news like the Popular Science Magazine and on TV. Unfortunately, they were discredited by their colleges from the "other site". So they ended up in France with their families. yes, there was a big reaction - quite negative - to the original announcement of Fleischman and Pons, but they and others have continued researching in the intervening years, and hundreds if not thousands of papers have been written about experiments, many of them successful, that showed excess heat and/or nuclear byproducts. Infinite Energy magazine has reported on these developments over the years. Hydrogen (as in the video you link) is ok, except there are two problems: One is that generally hydrogen is either made from hydrocarbons or by electrolysis, in an inefficient process. There is also pollution when cracking hydrocarbons for their hydrogen content, and when producing the needed electricity for hydrolysis. The other problem is that hydrogen has a comparatively low energy density, and it is exceeeingly hard to store in a car. It can be liquefied, but that requires energy to cool it, and is difficult in a mobile application, and it can be absorbed into metal matrices, but such storage is also heavy for mobile use, and it's expensive. So as long as we don't have a good technology for making hydrogen out of water with minimal expenditure of energy (so it can be done right on board with the "left over" electricity from the car's dynamo) hydrogen won't be a real solution to the problems we seek to overcome. "Instant academic publishing with transparent peer-review" is just what many are looking for. SEPP--- THANKS FOR THIS ONE-- I HAVE FWD'D IT TO SEVERAL RESEARCHERS IN THE GROUP. ONE OF THEM IS DOING A LOT OF WORK IN THE AREA SO WILL LIKELY GET SOME GOOD FEEDBACK. I KNOW OF A SIMILAR PROCESS WHICH INCLUDES GETTING MONTMORILLONITE CLAY INTO SOLUTION YIELDING SOME 80 ODD TRACE ELEMENTS. THEY COME OUT OF SOLUTION AS COLLOIDS WHEN ONE OF MY "RING" TECH TOOLS IS USED IN THE VICINITY OF THE REACTOR VESSEL.